Are you ready for the next challenge Warriors?? I have been running our 10K course for just shy of 4 years now. My Rich Hollmann interview a few weeks back peaked my interest in creating a more challenging course for those that are routinely conquering our hills doing doubles, triples and even 4 trips…a hills marathon! !…in order to continue to challenge themselves and improve their running ability. 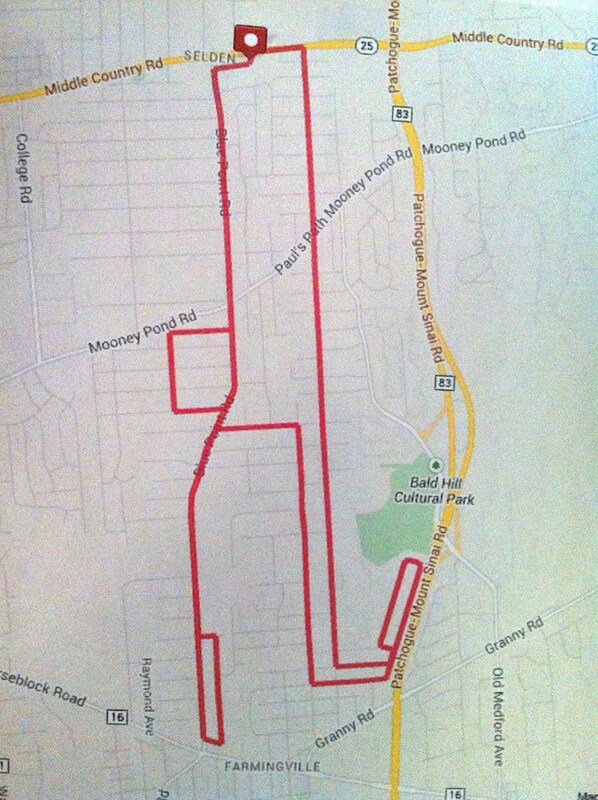 Therefore in addition to our beloved 10K course I have created The Selden Hills 15K Challenge. Or what will be come to be known as the Selden Hills Slaughterhouse! 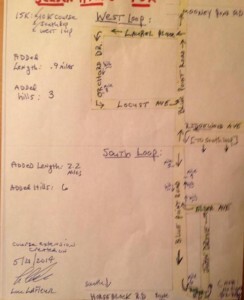 I have added an additional 5K (3.1 miles) to our current course. An increase of 50% in distance. There is a similar increase of 50% in the amount of hills as well. The increase consists of two loops, the south loop and the west loop. Course maps and turn by turn directions will be provided for tomorrow’s inaugural running of this course for those that want to take it on. 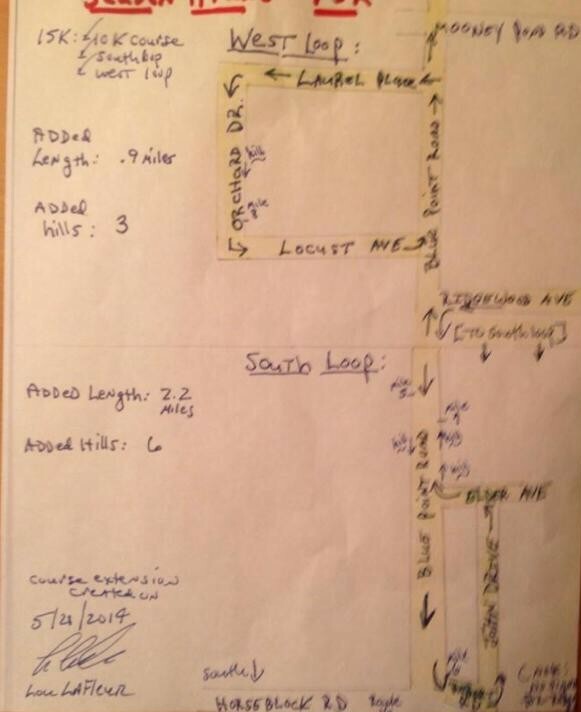 The South Loop is 2.2 additional miles and runs south on Blue Point Rd at the intersection with Ridgewood. It adds 6 additional hills. The West Loop is an additional .9 miles and runs west off Blue Point Rd at Laurel Ave just before getting to the Mooney Pond Rd traffic signal. It adds 3 more hills for a total of 28 hills for the 15K. The beauty of this course (did I say beauty?) is that you can make a decision whether or not to take it on when you get to the intersection with Ridgewood and Blue Point Rd. You feel confident and strong make a left onto the south loop. You decide the 10K course is enough for today make the usually right hand turn for the flat finish you have come to know and love!! 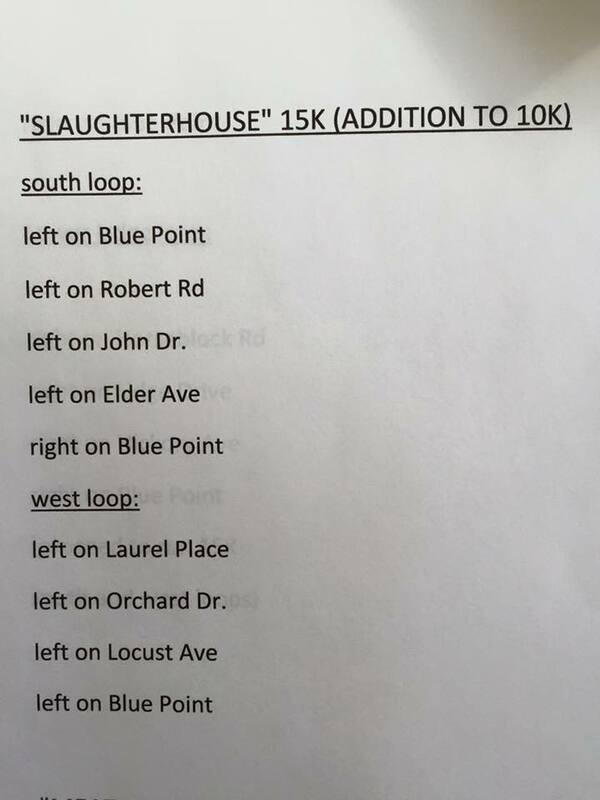 Another thing to consider when taking on “The Slaughterhouse” is that you will be running hills until mile 8. On our current course by mile 4.6 you are finished with hills except for the small one a half mile from the finish. 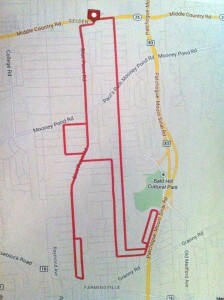 You will expend much more energy doing this 15K as opposed to running one and a half loops on our 10K course. I wouldn’t be too quick to sign up for a double on the new course just yet!! So get a good nights sleep and decide tomorrow if you want to create history on our hills by running the added “Blue Point Blitz” loops to go along with the Adirondack Attack and Berkshire Blast, so named by our hills predecessors. This ain’t your fathers Blue Point Road anymore!!! So arrive at 5PM if you want to be the first to start our new “roll call” for the 15K!! We will hopefully finish up with the 5:30PM 10K group to regal them with stories of how we survived the Slaughterhouse! !